President Barack Obama spent much of his time in Kenya on serious issues such as gay rights, but also found time to boogie with some of the country's most famous pop stars. 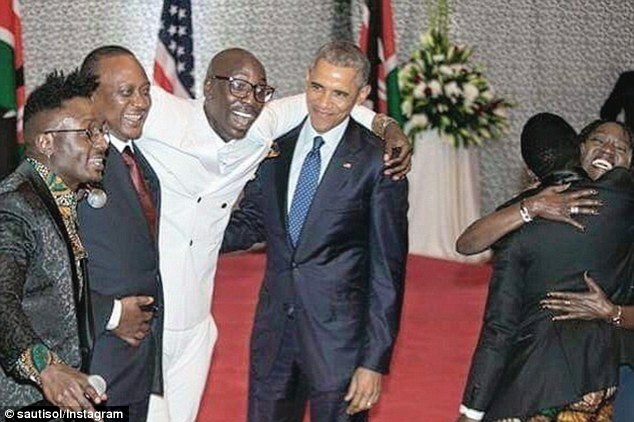 Four-man group Sauti Sol performed at a State House dinner hosted by Kenyan president Uhuru Kenyatta, who joined Obama and the musicians on stage for a dance. The dancers, accompanied by Kenyatta's wife Margaret Kenyatta, National Security Adviser Susan Rice and Obama's half-sister Auma, performed the Lipala dance that has recently taken the country by storm. A traditional dance, the Lipala has enjoyed renewed popularity after being reworked by Sauti Sol earlier this year in their song Sura Yako. The song, which translates to English from Swahili as 'Your Face' and praises a woman's beauty, became a quick hit due to its catchy melody and people posting videos of themselves dancing it on YouTube. 'To the right to the left, to the left,' Sauti Sol group leader Bien-Aimé Baraza is heard telling the president when he asked how to do the dance. 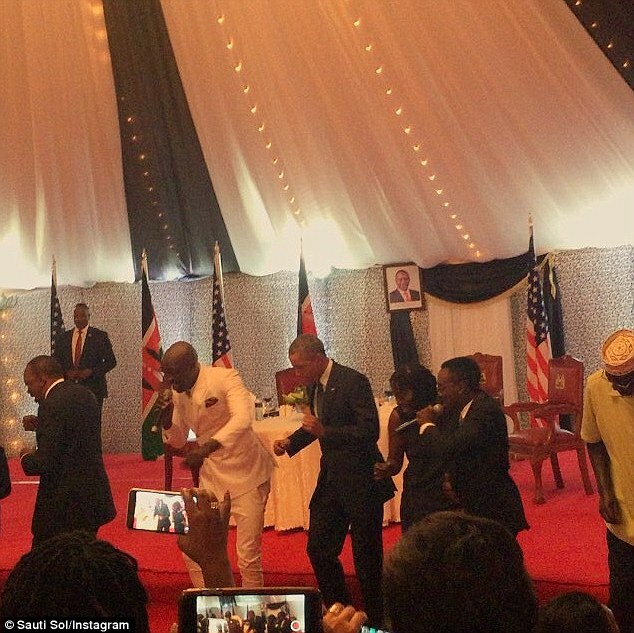 Attendees at a State House dinner in Nairobi saw US President Barack Obama join Sauti Sol on stage for their hit song Sura Yako.